Disk Drill, a new data recovery program for Mac OS X, has been introduced with the goal of keeping your files safe from permanent deletion. It works to prevent data loss in the first place with its unique Recovery Vault feature. Nobody wants to use data recovery software. After all, it means a disaster has struck your digital life and you’re franticly trying to pick up the pieces. When such a stressful ordeal occurs, having a safety net to fall back on can be invaluable. 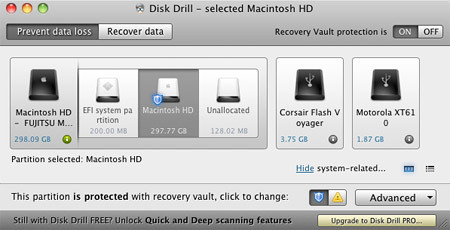 Cleverfiles, a Mac software developer, hopes their new Disk Drill data recovery application can be that safety net. Disk Drill is available in four different versions: Basic (free), Pro ($89), Expert ($169), and Enterprise ($299). Most folks will only need to worry about the Basic and Pro versions, though, so let’s focus on those. I’ve had some time to test Disk Drill and get familiar with how it works and, overall, I’m quite impressed with what Cleverfiles has put together. When you first launch Disk Drill, it greets you with a quick setup screen. This is where the software’s most important feature – Recovery Vault – can be enabled, but more on that later. The first thing you’ll probably want to do is browse through Disk Drill’s 9-step product tour. It’s a fantastic way to get acquainted with the software’s features and user interface. I really like how they set expectations upfront and explained exactly what the program can and cannot do. Those unfamiliar with how data recovery works will certainly appreciate it. Now, back to Recovery Vault. When a file is deleted from an HFS+ formatted drive in Mac OS X, all of its meta data is permanently lost. This includes the file name, location, size, and other properties. The actual raw file is still hidden on the drive until it gets overwritten by something else, but you’d have a heck of a time figuring out what to recover with no identifiable information available. That’s where Recovery Vault comes in. When this feature is enabled on your hard drive, it keeps an index of meta data for any file you delete. So in the event that you accidentally delete something and later realize you need to recover it, your chances of actually getting the data back will be much better. Recovery Vault doesn’t take up precious hard drive space and doesn’t slow your Mac down as it runs in the background, so it’s kind of a no-brainer. This kind of preventative measure could come in very handy during a meltdown. Disk Drill doesn’t require you to use Recovery Vault, though. You can recover data from any mountable drive (formatted HFS+, FAT, or NTFS) such as an external hard drive, USB flash drive, camera memory card, iPod classic, etc. Just go to Recover Data mode, select the disk, and choose a recovery method. Quick Scan will take just a few minutes to return a list of recently deleted files to recover on a healthy, undamaged disk. Deep Scan takes much longer and might be necessary in cases where the file system was screwed up, formatted, partitioned, etc. Even more helpful is Disk Drill’s ability to make a copy of an entire disk or partition as a DMG file. So if your flash drive is failing, for example, and you don’t think it will survive a deep scan, just back it up to your main hard drive as a disk image. Then you can scan the DMG from there, without fear that it will fail midway through. Entire missing or deleted partitions can be recovered as well. A few more notes about Disk Drill: You can preview a file before you recover it using Quick Look, so you know you’re getting exactly what you’re looking for. There are search and filtering features as well, to help you locate specific types of files with certain attributes. You can even pause a Deep Scan and continue it later, if you don’t have time to let it finish all at once. And, finally, there are S.M.A.R.T. hard disk monitoring tools that notify you if your drive is at risk of failing soon. Clearly, there is a lot to like about Disk Drill. It’s simple, well-organized, and most importantly – it works a majority of the time. I was able to see and undelete files I got rid of long ago with just a few clicks. As with all data recovery software, however, your mileage may vary. It all depends on how long ago the data was deleted and if anything has overwritten that part of the drive. Please be aware that Recovery Vault is not a backup system. It serves as a helpful tool to get your documents, images, music, videos, etc. back more easily in the event they are not properly backed up. You should still use software like Time Machine or SuperDuper! to regularly back up your data to an external device. 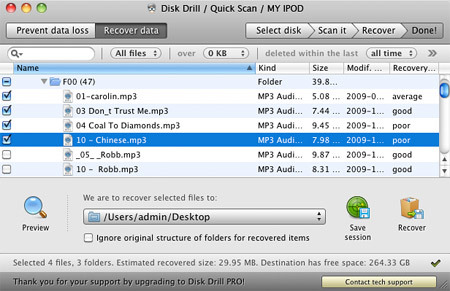 Disk Drill Basic gives you Recovery Vault and the ability to scan for lost data for free. 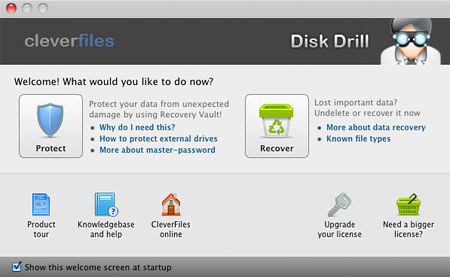 To actually recover deleted files, you’ll have to purchase Disk Drill Pro for $89 from the Cleverfiles website. The developers have been kind enough to offer all of MacYourself’s visitors a 20% off coupon on all versions of Disk Drill. Just enter MACYOURSELF as the promo code during checkout to receive the discount. Despite the high cost, Disk Drill is definitely recommended in the unfortunate event you might need to recover data on your Mac. This is a nice post regarding deleted files on mac OS. But I found “remo recover” application on internet to retrieve deleted data on Mac OS.